That’s Stephen Clapper, a photojournalist in Nashviille, filming more than two hours of footage for a 2 minute video segment set to air on NewsChannel5 in Nashville. 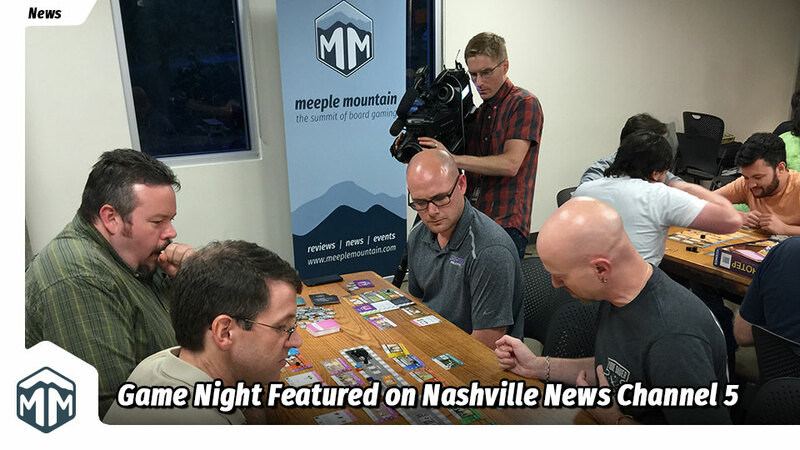 At the end of August Stephen approached me with an idea to do a story on Nashville Game Night. I came across your website while searching the net for interesting story ideas. I see that Meeple Mountain hosts a game night each month. I think this could make a really cool feature story. We have a segment in our Friday 6:30 newscast called “Celebrate Tennessee” where we highlight unique, fun, and inspiring things that happen here in our area. I wanted to see if this would be something you folks would be interested in. We decided that our September event would be a perfect time for this to happen and so we set it into the schedule. I reached out to Gil Hova of Formal Ferret Games to ask if he’d be willing to donate a copy of his hit game The Networks as a prize for this month’s event. (Check out our review of The Networks). The segment aired during the evening news on September 16th, please check it out. Our next event is October 20th and you should totally join us for lots of fun and gaming!